Tomlinson Furniture of Grand Cayman is known as the Cayman Islands’ best source for quality furniture. We’re known for providing mattresses at unbeatable prices, as well as our selection of island furnishings, and American-made furniture. At Tomlinson Furniture you will experience a unique furniture shopping experience with a large selection of affordable, dependable and quality furniture. Tomlinson Furniture was established in 1976 by Tony & Chrissie Tomlinson. They recognized locals and rental properties on Grand Cayman had a need for quality furnishings. 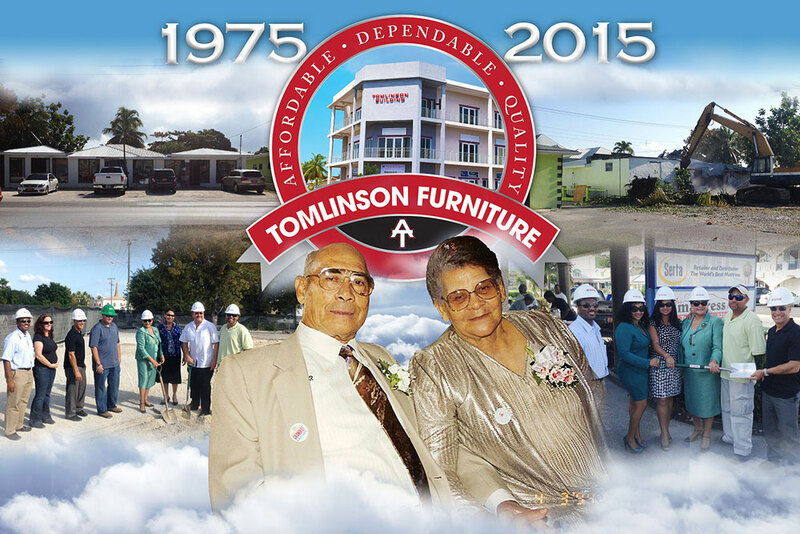 In 2007, Tony & Chrissie’s daughter Jacqui Tomlinson-Smith took ownership of Tomlinson Furniture. Today, the company has grown with over 40 years of experience, because of their dedication to the locals, property owners, hotels, and boutiques throughout the Cayman Islands. Throughout those 40 years, Tomlinson Furniture’s mission has remained the same - to sell the Cayman Islands’ most Affordable, Dependable and Quality furniture products. At Tomlinson Furniture on Grand Cayman, you will find the largest selection of In-Stock mattresses in the Cayman Islands, Island-Wide Free Delivery, Guaranteed Best Prices, and wide selection of furniture to add style and comfort to any home. Come in and see for yourself why Tomlinson Furniture is Grand Cayman’s best kept furniture store secret. Why shop at Tomlinson Furniture? What separates Tomlinson Furniture from other Cayman Islands’ furniture stores is our company’s founding principles of service, competence, experience, and expertise. Our professionalism, detailed planning, timeliness, and customer-focused management, are what make us one of Grand Cayman’s most rewarding shopping experiences. We set a service standard in the Cayman Islands that’s second to none, which is why we have so much repeat business. For over 40 years we’ve provided the best value on affordable furniture pieces – whether you’re looking to furnish a living room, dining room, bedroom, and entire rental property project, or just looking for a few pieces of island furniture to set the tone for your island home away from home. Tomlinson Furniture carries a wide range of furniture and accessories, from traditional to contemporary, and everything in between. With a wide selection of home furnishing items for your living room, dining room, bedroom and home office – you’re sure to find the couch, recliner, dining set, dressers, nightstands, desks, or just about anything you’re looking for to make your Cayman Islands home more stylish and comfortable. We even have rare, one of a kind furniture and accessories that are only found at Tomlinson Furniture, on Grand Cayman. Tomlinson Furniture features top name furniture and mattress brands such as – Ashley, Furniture of America, Coaster, Stanley Chairs and other American-made brands - all at a great value. We are Grand Cayman’s exclusive dealers of brands such as Tempur, Serta, Palliser, Beautyrest, Simmons and Sealy. Tomlinson Furniture is best known for mattresses at unbeatable prices! We are also the only furniture store on the island that offers a true mattress warranty and sleep trial. Our “mattress gallery” offers mattresses to fit any budget, style or sleep need. We also offer free Island-wide delivery and setup services. Whether you’re looking for that special mattress, or need mattresses for a number of rental units, Tomlinson Furniture is the mattress store with more! Our vast inventory and available resources ensure your purchase is available when you’re ready to buy. While special orders are available, they are not normally required, due to our extensive inventory and available inventory resources. Another reason you want to make Tomlinson Furniture your Grand Cayman Furniture Store. Please contact us today to see how Tomlinson Furniture can help you with your personal home design needs!